I was on active duty as a Marine Corps officer and pilot from November 1954 to May 1957, and in the Reserve until 1962. To support the following facts, my flight log shows flights of HOK-1s in September 1955 at Patuxent River NATC and May 1956 at Okinawa. On May 23, 1956, VMO-2 received eight HOK-1 's at Naha, Okinawa. The machines were offloaded from a freighter to the wharf where rotor blades were installed . The machines were flown by Kaman test pilot Pete Russell and VMO-2 pilots to the VMO-2 base at Sukiron for inspection and test flights. From "Kaman Rotor Tips" , May 1961 - page 19 : Helicopters of Sub-Unit 1, VMO-2 at Atsugi. 1962 From "Kaman Rotor Tips" , June 1962 - page 16 : VMO-2, MAG 16, MCAF Okinawa - HOK-1's attached to VMO-2 land on the carrier USS Princeton during maneuvers in the Western Pacific. From "Kaman Rotor Tips" , Oct 1962 - page 3-6 : The squadron calls MCAF Futema, Oki­nawa, home, but Sub-units of the squadron are likely to be found scattered throughout the Far East. In order to carry out all of these varied missions, the squadron employs the Kaman HOK-1 and Cessna OE-1 type aircraft . The squadron was in the Philippines partici­pating in "Operation Tulungan. " The squadron had aircraft oper­ating in Japan, on the LPH Princeton, NAS Sangley point, and two locations on Mindoro Island, Philippines. Also, during this maneuver the entire squadron, including all personnel, equipment, and aircraft, were moved from the aircraft carrier to shore and back again, three separate times. The nine HOK's participating in this ma­neuver logged 428 hours in 13 flying days. Whenever aircraft are transferred to Japan, Korea, Philippines, or other areas in the Far East, they usually are dis­assembled and airlifted by Marine GV's or Air Force Globemasters, then reassembled on location. During the past ten months the HOK's were disassembled and reassembled 21 times and the OE's ten times. 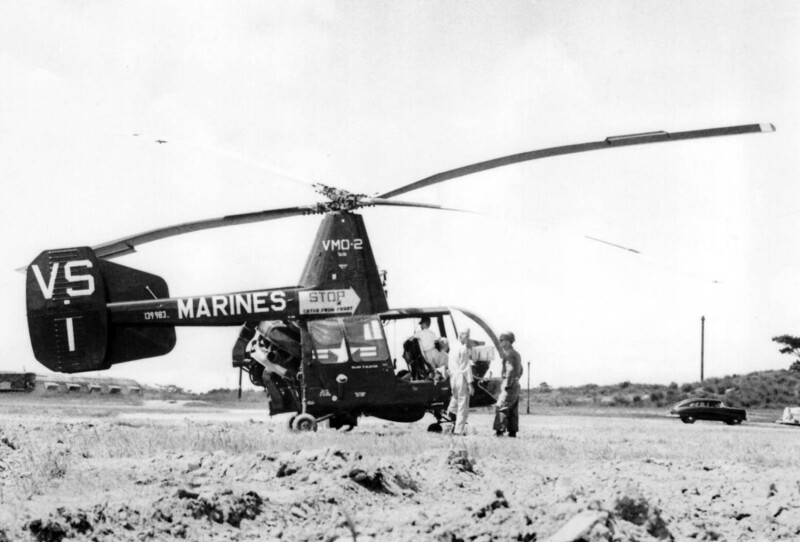 1963 From "Kaman Rotor Tips" , Apr 1963 - page 6 : An OH-43D (HOK-1) attached to VMO-2's Sub Unit One based at NAS Atsugi, Japan, recently logged its 2, 000th accident-free flight hour to become the third helicopter of this type to obtain such a goal. This is the second time that VMO-2, which is stationed on Okinawa, has surpassed the 2, 000th accident-free hour with an OH-43D-the first was in April, 1962. VMO-6, based at Camp Pendleton, Calif. , first set the record in March, 1962. From : "Kaman Rotor Tips" , Aug 1964 - page 20 : "Marine Mercy Mission"
Capt George E. Pratt, USMC, of VMO-2, MCAF, Futema, Okinawa, was awarded a Scroll of Honor re­cently for the night helicopter evacu­ation of a seriously injured civilian from the jungle on Mindoro Island , PI. Darkness was fast approaching when Captain Pratt, in an OH-43D, heard a call on Guard channel from a forward air controller on the ground. A civilian had a badly lac­erated leg and needed immediate medical attention. The captain pro­ceeded to the area and was vectored into the landing zone by the lights of a jeep. The trees in the area were from 100 to 150 feet high but, with radio help from the ground, he was able to land and evacuate the injured man to a field hospital. MCAF FUTEMA, OKINAWA, Office of Information - One of the "flyingest" helicopters west of the In­ternational ternational Dateline and east of San Diego set a milestone in Marine Corps helicopter aviation recently at Futema, Okinawa. On 19 October, 1964, "Old Num­ber Nine, " an OH-43D (HOK-1) manufactured by the Kaman Air­craft, Corp., completed 3000 flight hours and nine years of active ser­vice with Marine Observation Squad­ron Two stationed at Futema. It also rounded out 180, 000 accident and incident-free air miles in end­ing its service career. LtCol J. L. Freitas, Jr., commanding officer of VMO-2, was at the controls for the historic flight; Mr. William Murray, KAC vice president, was copilot. VMO-2, one of the squadrons making up Marine Aircraft Group 16 stationed at Okinawa, accepted Number Nine in April of 1956. Since that time squadron pilots have tested Nine's worth in training missions as a part of the Marine Corps' Force in Readiness in such locations as Formosa, Korea, Japan and the Philippines. Marine observers have used the aircraft to perform land and carrier-based operations in­volving reconnaissance, naval gun­fire spotting, artillery spotting, photo reconnaissance and the direc­tion of close air support attack air­craft. When not flying tactically, the marines have flown Number Nine on routine training flights, search and rescue assignments, and for emergency evacuation of sick, wounded or injured marines of the 3rd Marine Division, also stationed at Okinawa. The nine years and 180, 000 air miles of accident/incident free fly­ing for Number Nine is mute testi­mony to the outstanding mainte­nance and repairs Nine has received at the hands of VMO-2 mechanics electricians, metalsmiths and plane captains. In fact, the mechs and the plane captains have kept the 'chopper' in the same state of com­bat readiness as when it first joined the Corps. VMO-2 will be receiv­ing anew jet helicopter soon, but 'Old Number Nine' goes into retire­ment as a tough, dependable, proven veteran, ready for recall should the need arise. From "Kaman Rotor Tips" , Aug-Sep-1965 - page 15 : "Veteran OH-43D Retires"
photo 139990 "VS 4" Okinawa (KamanRotorTips Feb 1963-p.6) with "VS 1" and "VS 6"
photo 139984 "VS 10" Philippines Jun 1964, with "VS 5", "VS 6" and "VS 11"